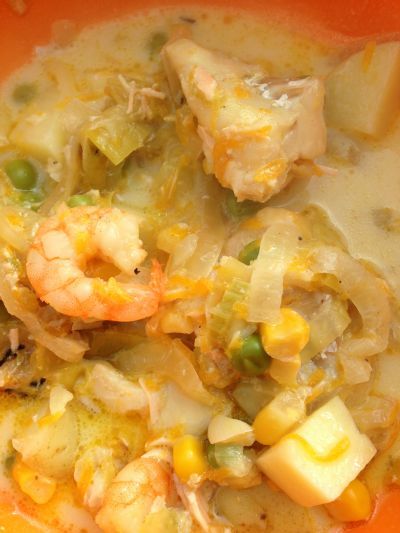 To kick off my nine months of recipes challenge I made this delicious fishy stew last night. It is quick and easy to make and tastes amazing. 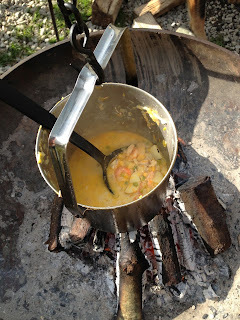 We cooked it in the billy can over the fire pit and it was a big hit with the kids. You can do it on the stove well too though. Make it cheaper by omitting the seafood and using frozen fish or make it fancier with smoked salmon, crayfish etc. Don't forget, if you like this recipe and use it then a donation to Pregnancy Sickness Support would be greatly appreciated. You can donate anything from 50p to £50 via my BT MyDonate page; every penny helps! Some prawns, I do a mix of king prawns and shrimp. About a handful of each. About 500g of potatoes, diced up pretty small so you can eat it all with a spoon. Well if you are short on time you can literally put the whole lot, except the crème fraiche, in a pot, bring to the boil and simmer for about 15-20 mins, or until the potatoes are cooked then stir in the crème fraiche at the end. But if you're not short of time it's much better if you soften the onions in a frying pan and after a few mins add the celery, grated carrot and garlic. Once it's all soft and smelling great then stick it in a big pot along with everything else except the crème fraiche and boil as above. When I say about 700ml stock and the glass of wine, basically you want to just cover the ingredients. Other things you can chuck in... add a chilli if you like it hot; a couple of bay leaves would do no harm; or some parsley at the end perhaps? I add black pepper to almost everything too. Sorry the pictures aren't great, it was a last minute decision to do this recipe challenge... thought of half way through dinner last night... I'll try to get picture before eating the next one!